Ahoy Matey! Looking for the perfect Christmas gift for your little one? Don't miss this magical evening with Jake and Sofia on December 29th. 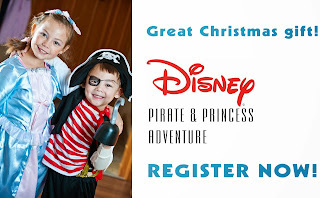 Enjoy tasty treasure box treats, make crafts together and then sail away to a showing of Disney Live! Pirate and Princess Adventures. Registration includes snacks, craft, professional portrait photograph per enrolled child, transportation and show admission. Bring child car seats if required by law. Sign up online or in person at the Wylie Recreation Center.